Australian Eucalyptus Honeys: River Red Gum, Blue Gum, Messmate and so many others. Australian Eucalyptus Honeys are all known to have 3 major health benefits, besides the already known benefits found in any type of honey. They fight against infections and diseases of respiratory organs, heal infections and diseases of urinary passages and increases immunity. “Honey Flora in Victoria”, a reference book by FR Beuhne, classifies eucalyptus trees in 10 big groups and gives details regarding the nectar yield and quality of honey. 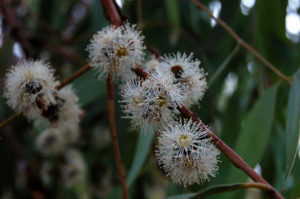 Box Honeys are probably the best well-known Australian eucalypt honeys, but locals also appreciate other honeys like: River Red Gum, Blue Gum, Messmate, Silver Stringybark. The representatives of this group, offering good honey, are River Red Gum and Blue Gum. It’s the most widespread species of Eucalypts in Australia and one of the best known and most valuable of our timber trees. A tall tree, growing over 35 meters, As its names suggests, it grows along river banks and watercourses or on flood plains and is found over most of the Australian mainland. The tree blossoms every second year, usually the same year as Yellow Box, and concurrently with it, from December to January. The bloom does not last long on a tree, and there is not much variation in time between different trees. The flowers are usually in clusters of 4 to 14. 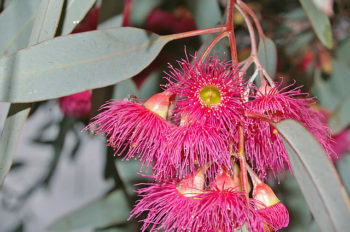 Red Gum also produces pollen in great quantities, and is therefore exceedingly valuable in Yellow Box country, as the pollen not only keeps the bees going in brood rearing, but also enables them to collect a good store for a time of scarcity. The secretion of nectar is often very strong – it is in fact one of the heaviest nectar yielders. Red Gum honey is of a clear golden color, not quite as dense as from Yellow Box, less aromatic, but of a milder and very smooth flavor. It crystallizes quickly and sets very hard. 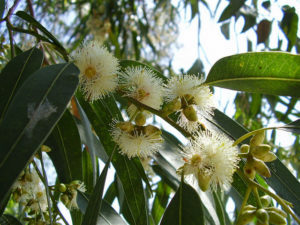 Another famous eucalypt of Australia, which was introduced at the beginning of the twentieth century in the Mediterranean countries of Europe, mainly along the coasts, India and South Africa, being cultivated for the paper industry, the essential oil and as ornamental. The tree is also known as Tasmanian blue gum, fever tree, southern blue gum or blue gum. 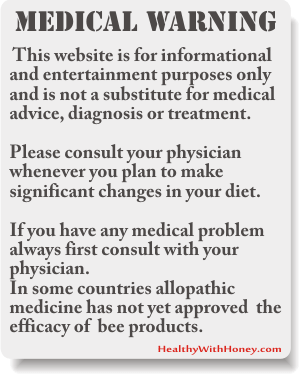 The usual eucalyptus honey that we find on the market comes from Europe (especially if you live there) and not from Australia. We need to check the country of origin on the label to be sure. In Australia this honey is often sold as blue gum honey. The representatives for this group are Messmate and Silver Stringybark. Also known as: Australian Oak, Brown Top, Brown Top Stringybark, Messmate, Messmate Stringybark, Stringybark and Tasmanian Oak. It is native to south-eastern Australia. It’s quite an impressive tree: up to 90 meters high, with a trunk up to three meters in diameter. The flowers form clusters from three to twenty blossoms and grow from the shoulders of leaves or sideways from the branches. It usually flowers from January to February and rather abundantly, but not every year. The messmate honey is one of the darkest, particularly in wet locations, resembling molasses. It is clear, quite dense and of aromatic and strong flavor. 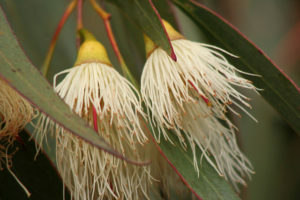 Known as Mealy Stringybark and native to Victoria and parts of New South Wales. It usually flowers from March to August, making flowers form clusters from seven to eleven stalkless diamond-shaped buds with waxy coating. Silver Stringybark blooms late in the season, and honey bees gather both nectar and pollen. The honey is fairly dark, similar to messmate honey. It is clear, quite dense and of aromatic and strong flavor. The tree is also known as Rough or Black Ironbark grows on ironstone ridges and gravelly rises. Just as the names suggests, the bark is very hard and very thick. The wood is tough, hard and strong, being one of the most durable and valuable of all hard woods. The tree looks a lot like the Yellow Gum Tree (previously called White Ironbark), with leaves, flowers, buds and fruits almost identical. The difference is given the the general appearance, bark and color of the wood. 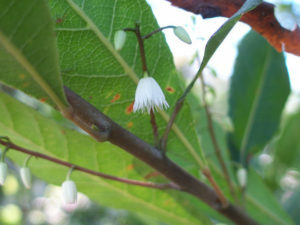 The flowers are white and sometimes pink and blossoms between June and September. The Red Ironbark honey is of a fine quality. Honey bees collect only the nectar, not the pollen. It crystalizes like the Yellow Gum, into fine grains. Aka Narrow- Leaf Peppermint, or The Common Peppermint. 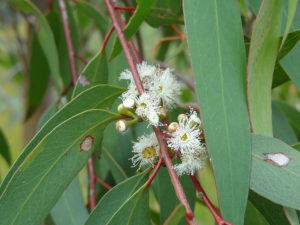 This tree can be found in Victoria, New South Wales, and Tasmania, usually occurring on poorer soils and in the cooler districts. Its name comes from the leaves,which have a strong peppermint odor when bruised. The narrow-leaved peppermint blossoms from October to December, in some districts January, February, practically every year, and rather profusely, but it does not produce much nectar and pollen. The flowers do not produce much nectar nor pollen. The honey is clear, medium to dark amber color, quite dense, and of an aromatic and smooth flavor. It crystallizes quickly and sets very hard. Also known as Black Mallee, the tree has a shrubby growth with a smooth greyish bark. It flowers profusely every second year during March, April and May and in some places from June to November, lasting for 12 weeks. From all Mallee eucalypts this one offers the most nectar and pollen. 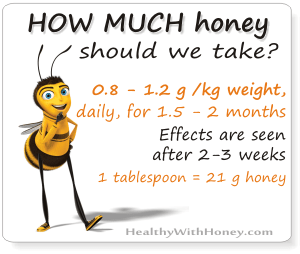 The honey made of it is of good quality, yet not very dense due to a higher degree of humidity. Beekeepers can rectify this by running the honey from the extractor through a suitable heating device, as it is done with honeys from late flowering trees. The honey is not very solid after crystallization. There are over 40 species of Banksia and Coast Banksia is the larger, the tree having 40 to 50 feet high and diameter of the trunk up to 4 feet. It is also known as Honeysucker, Tree-Honeysucker, Coast Honeysuckle or White Honeysucker. Its timber is pinkish, beautifully grained, taking good polish. The Coast Banksia makes plenty nectar and pollen and bees loves it. 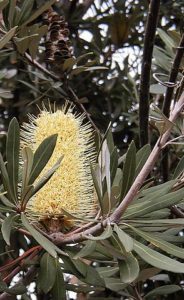 The honey produced is of a darker color, with a strong and distinct aroma, peculiar to Banksias. It crystallizes fast and hard. – Manuka trees (leptospermum scoparium) which have been very researched lately, due to its highly antimicrobial effect. 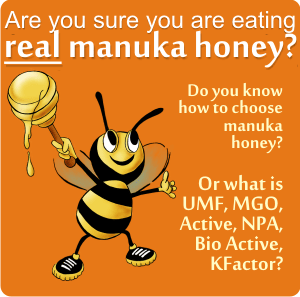 You can find details in the articles found at Manuka Honey category. 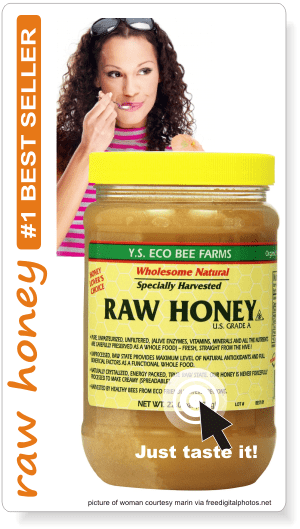 While this honey is an emblem of New Zealand, Australia also has important areas with manuka trees and produces considerable quantities of manuka honey. Kanuka Tree, also known as White tea-tree or Burgan, was previously classified as being in the genus Leptospermum, but today it is classified in the Kunzea genus. The nectar of this tree makes a wonderful honey known for its therapeutic effects on complexion, successfully treating acne and rosacea. Here are some of the eucalypts found in this group, producing nectar. 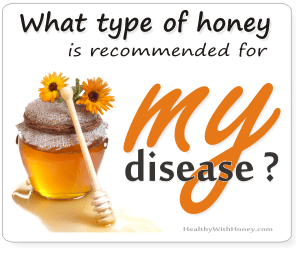 Read more about: Eucalyptus honey.